Spare a sympathetic thought, if you will, for J.C. Penney's social media team. 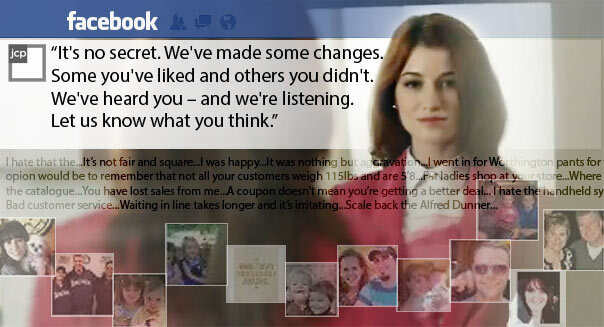 The poor souls manning J.C. Penney's (JCP) Facebook page on the day it released its now-famous "apology" had the unenviable task of responding to nearly every commenter who had something to say about the retailer's failed makeover and subsequent about-face. And the fans had a lot to say: In the week since it released its video apology, the post has racked up nearly 20,000 comments. Those comments run the gamut from praise to criticism to unhinged rants (we're especially fond of the commenter who bemoaned the "glittery hoochie mama clothing and wannabe thug jerseys"). But fans also had some very specific suggestions for how the new management can turn things around, and a few of them seem like they're really onto something. J.C. Penney's comeback campaign is centered around a simple, two-word phrase: "We're listening." Here are some of the suggestions they should be listening to. It was repeated so often that it became dogma: Ron Johnson's greatest sin was ditching the sales and coupons. Johnson himself called it a "mistake," and one of his last acts as CEO was to abandon his pricing strategy and bring back the coupons. While many commenters cheered the coupon comeback, a few were more skeptical of the return to the old regime. In fact, many noted that the retailer was obviously just jacking up prices just so they could lower them again with discounts. Obviously J.C. Penney needs to bring back the sales and coupons if it wants to attract its wayward customers, but it should probably find a more subtle way to do it. Johnson was criticized for abruptly abolishing coupons without first testing the strategy; if the new management just slaps on higher price tags and then hands out coupons, it risks making the same error in the opposite direction. One commenter identified herself as a sales associate for J.C. Penney, and said she hated the "dog and pony show" of the old coupon regime. Her comment got more than 300 'likes,' as well as comments from other sales associates who expressed how difficult it was to deal with price adjustments, extreme couponers and confusing sales. "As an associate, I had Nightmares in Nov & Dec of 2011 when the coupons were out in Groves [sic]," said another commenter, who went on to suggest that the retailer should place limits on how many coupons shoppers can use. The lesson for management? If you're going to bring back coupons, don't make a complete return to the "death by coupon" era -- it can be a huge pain for your employees. In overhauling the retailer's apparel offerings, Johnson evidently wanted to transform its customer base into something more closely resembling Abercrombie's young and skinny crowd. Unfortunately, that meant that J.C. Penney's larger customers were left out in the cold. Various commenters complained that plus-size offerings have dwindled significantly, and that they'd like to see all styles of clothing available in larger sizes. If the new management (which is mainly the old management) wants to win back customers, it will need to make sure customers of all sizes are accommodated. Several commenters said that they missed being able to shop and order through a catalog. Sure, most people who can't make it into the store will be inclined to shop online, which is more cost-effective for retailers than shipping out heavy catalogs and taking orders by phone. But members of J.C. Penney's older customer base may not be as technologically inclined, so it's likely missing out on sales by not providing it as an option. The retailer has already made concession to its older shoppers by bringing back St. John's Bay and other "basic" clothing. Making it easier for them to shop from home would also be a good move. One innovation that Johnson brought over from the Apple Store was the mobile checkout: Instead of waiting in line, customers could get checked out by a roving cashier toting a smartphone or tablet. But much like the pricing strategy, mobile checkouts apparently don't play as well in a big department store as they do in the Apple Store (AAPL). We've heard from J.C. Penney employees complaining about the switch, and it looks like customers aren't thrilled either; a few commenters noted, for instance, that the process makes getting a receipt a hassle. Maybe the system has been implemented poorly, or maybe it's just a case of an older customer base being confounded by innovation. Either way, this looks to be another change that J.C. Penney should scale back or reconsider. Ron Johnson had a vision of a department store as a marketplace -- instead of just organizing clothes by department, he would have a collection of boutiques, each dedicated to one brand. But the stores-within-a-store concept might be confusing some customers. One commenter pointed out that the layout makes comparison shopping difficult, forcing customers to visit multiple boutiques just to find a pair of jeans. Other commenters echoed that complaint, noting that they found the layout so frustrating that they left the store empty-handed. The retailer has burned through a whole lot of cash remaking its stores, so we imagine management isn't thrilled at the prospect of undoing those changes. But if they want to get sales figures back up, they'll need to arrange their stores in a way that makes comparison shopping among its brands easier.